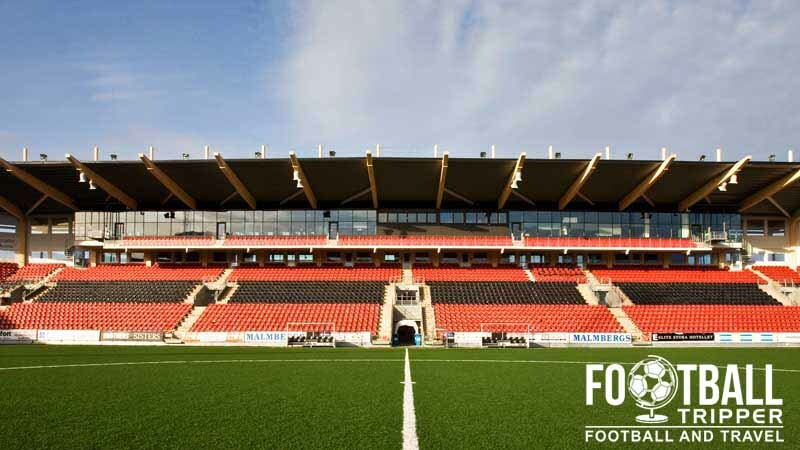 Behrn Arena still commonly known by its previous name of Eyravallen is a purpose built football stadium located in the Southern Swedish city of Örebro. 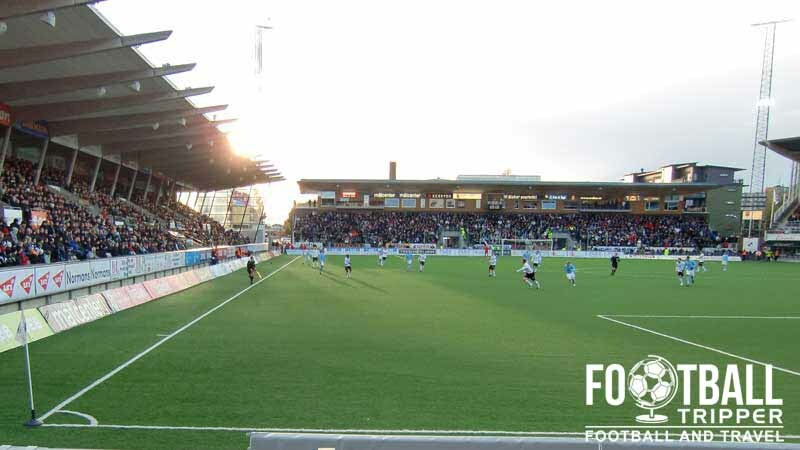 First opened in 1923, the home ground of Örebro Sportklubb has a capacity of 14,500 although the attendance is set at 20,066 which was set in 1961. Behrn Arena first opened back in 1923 when it was known as Eyravallen, a name which is still commonly used to this day. The stadium has undergone numerous renovations since opening, with the most significant coming since the turn of the millennium when three out of four stands were completely rebuilt. The first to be upgraded was the North Stand in 2003, followed by the West Stand in 2007, and the East Stand in 2009. The only remaining stand from the previous era was the southern part of the ground which first opened in 1974, and was capable of seating 3,000 fans. 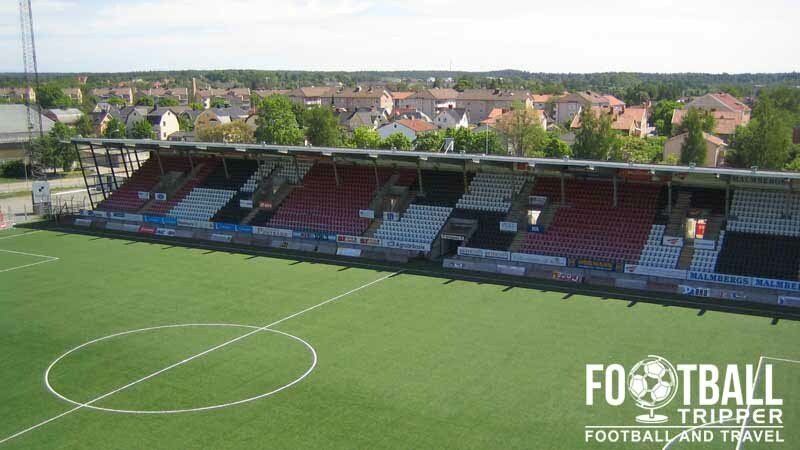 Eyravallen’s capacity peaked in the 1960s in the era of terraces, and the record attendance is currently 20,066 which was set on 8th June 1961 during a game between Örebro SK and Degerfors IF. As the stadium currently seats 14,500 the record is unlikely to ever be beaten in the foreseeable future. The most recent change to occur at Behrn Arena occurred in 2003 when the natural playing surface was replaced with a type of astroturf. A controversial issue throughout Scandinavia, for Örebro SK at least it was seen as a “no-brainer” due to the city’s coastal location and resultantly harsher climate. To date the highest level of football played the stadium has undoubtedly been the match between France and Scotland during the 1958 World Cup. As for the modern era of the Behrn Arena, the the highest level would be the qualification match for the Europa League. Örebro SK were drawn against Bosnian Side FK Sarajevo but were edged out by 2-goals on aggregate. The Behrn Arena is comprised of four stands: North, East, South and West. 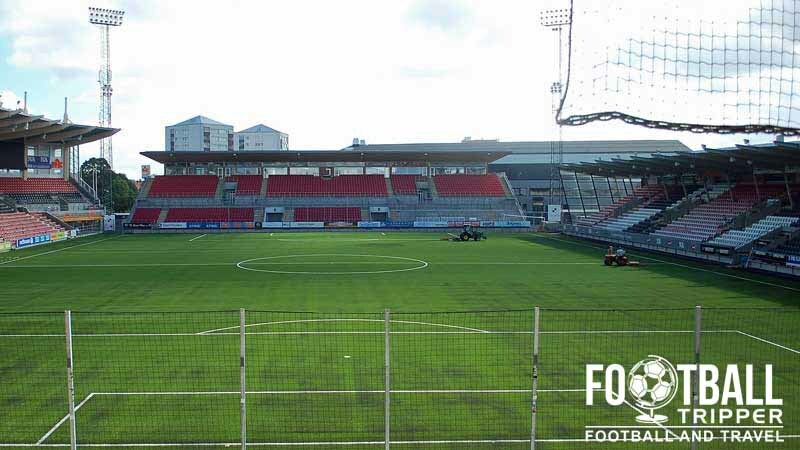 Away fans (Bortasupportrar) appear to be housed within the lower tiers of of the eastern goal-end as shown in the grey sections (U, Borta Sta) in the above seating plan. Fans can purchase official merchandise of Örebro SK from either the ground on matchdays, the club office during the working week or the online store which is open 24/7. It seems unlikely that the facilities at Behrn Arena would be deemed worthy of a tour but stranger things have happened. 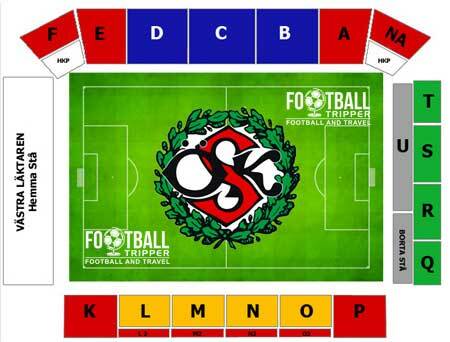 Tickets to see Örebro SK can either be purchased online from the official website in advance of the match or at the ticket booths around Eyravallen which open 90 minutes before kick-off. Behrn Arena is situated approximately 1.5 km south of Örebro city centre sandwiched between the Rudbecksgatan main road and the railway track. From the city centre most Football Trippers would be looking at a walk of around 20 minutes. There are quite a few little areas of tarmac and gravel scattered outside the ground which are used as parking spaces. Make sure you get to the stadium early to secure your spot. Örebro is blessed with two railway stations: Centralstation in the city centre, and Södra to the south. Both are located in excess of 1.5 km from Eyravallen so there aren’t really any locational advantages to either. The unassuming exterior of Orebro Sodra Station, the smaller of the two stations. Behrn Arena bus stop is located north of the ground on Rudbecksgatan and is served by bus numbers 2, 3, 721 and 727. Örebro Airport which has a few direct services to the likes of Malmo and Copenhagen is situated 10 km southwest of the city centre. The city centre is packed full of accommodation options such as Scandic Grand Hotel, Best Western City Hotel and the Clarion Hotel. Two of the more affordable options are undoubtedly Hotell Gota, and Hotel Storgården which are both north of the river.